Why choose Nuffield Health Guildford Hospital for your liposuction treatment? When undergoing any cosmetic surgery at Nuffield Health Guildford Hospital, you will receive the individual attention you need and deserve. Our experienced cosmetic consultants specialise in liposuction treatment and regularly help their patients lose that stubborn fat which doesn't seem to budge after conventional dieting and exercise. We know that making such a personal and potentially life-enhancing decision isn’t easy, undertaking any form of surgery is a big step and we insist all patients engage fully with one of our consultants, ensuring they are well informed before making the right decision. If you are unsure about liposuction treatment or wondering whether it can help you, feel free to attend one of our complimentary cosmetic surgery open events. Alternatively you can call our experts in Guildford to arrange a consultation and find out if liposuction is right for you. 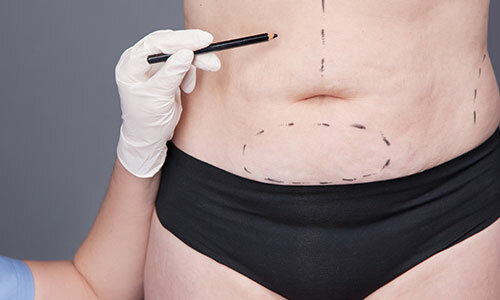 Liposuction - What areas of the body can be treated? What happens during liposuction at Nuffield Health Guildford Hospital? The area will be bandaged for support. However it may take up to six months to the area to settle down completely. Except when bathing an elastic support garment must be worn day and night around the operation site (does not apply to facial surgery). Return to work if approved by your surgeon. You no longer need to wear support garment. You may feel some numbness in the area. Final result can be judged, as long as your weight has remained stable. What are the complications of liposuction treatment? Every surgical procedure has a chance of complications arising. And like any other surgical treatments, be sure and discuss any concerns you might have about the associated risks with your consultant surgeon. Lumpy appearance as remaining fat settles.